Born in 1951, he was well known for founding the Kenya Medical Research Institute (KEMRI) in 1979. Dr. Koechpioneered many innovative research projects in the country which included the search for a HIV/AIDS cure.He has also served as the Chief Research Officer and Director of KEMRI. In 1974, he earned his BSc (Chemistry & Zoology) from the University of Nairobi and MS (Clinical Pharmacology) from the Duquesne University, Pittsburgh (USA) in 1977. He also holds a Ph.D. (Medical Pathology, Immunology) from the University of Nairobi, Doctor of Science (DSc) from Moi University, and Cultural Doctorate (CuD) in Therapeutic Philosophy from the World University, USA in 1988. He is also a Chartered Biologist (CBiol), a member of (MBiol), a fellow of the Institute of Biology (FBiol) of the UK and a Fellow of the Institute of Biology (FInstPM) of Great Britain.He is a visiting professor of Immunology and Molecular Medicine since 1989 to numerous universities. 1981-84, Head of the Division of Vector-Borne Diseases in the Ministry of Health. He is credited with being the chairperson of the Commission of Inquiry into the Education System of Kenya, which came up with the ‘Totally Integrated Quality Education and Training (TIQET)’ report. He is also a founder member of the Drugs for Neglected Diseases Initiative (DNDi), a National Chancellor for Kenya representing the International Association for Educators for World Peace and in the International Who is Who in Medicine, International Biographical Centre (IBC), England. He is the Editor-in-Chief of the African Journal of Health Science and has authored 161 journal publications in many medical fields including AIDS, Schistomiasis, Malaria, and other diseases. He served as the chairman of the Pan-African Parliamentarians’ Network on climate change, in his time in Parliament. However, on his downside he was charged for fraud in which KEMRI lost more than Ksh 19.3 million as its director. In 1984, he received the Presidential Award (State Investiture) of Decoration of the Silver Star of Kenya (S.S). In 1989, he received the Presidential Award (State Investiture) of Decoration of the Order of the Grand Warrior (OGW) of Kenya. In 1998, the President honoured him with a Moran of the Order of the Burning Spear (MBS). In 2006, he was nominated for 2006 Genius Laureate and of the American Biographical Institute and his name will be among the 500 Greatest Geniuses of 21st Century. He is also a recipient of a Gold Medal from the Foundation for Excellence in Business Practice. Under his stewardship KEMRI received the Kenya Institute of Management’s Company of the Year Awards (COYA) for 5 consecutive years (2001-06) and parastatal of the Year Award from 2003 to 2007. In 2007, he was the recipient of the COYA’s CEO of the Year. Dr. Davy Koech never founded KEMRI. This claim is one of his many frauds just to earn him some dubious fame. Doech was a Director of the Divison of Vector Borne Diseases (DVBD) at the Public Health Laboratories, Nairobi. The Founders of KEMRI were Drs. Peter Tukei (Virus Research), Dr. Aluoch (TB Research), Dr. Wegesa (malaria Research), Dr. Njogu (Trypanosomiasis Research) and Mr. Noah Okulo as its first Administrative Chief. These were all former East African Medical Research Council Employuees. During KEMRi's founding Koech was still at the DVBD and did not even know where the idea of KEMRI came from and who coined the term KEMRI. HE is a liar and a fraudster as time has proofed him to be.But con men and fraudsters are always like that. They talk their ways into fame on other people's backs albeit short lived. 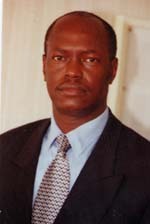 Mr. Elijah Ombongi Ombaso was a staff member of KEMRI during the tenure of Prof. Koech. He had requested to travel to the UK for further studies. He was granted leave of absence, but his pay was discontinued on account of of his failure to account for his academic progress as demanded by the regulations. His whereabouts have since been unknown. His bitterness has nothing to do with the establishment of KEMRI. It well known for a fact that Prof. Davy Koech was a founder member of KEMRI. It is a published record and everyone is fully aware of that. It is unfortunate that Mr Ombongi's frustrations wherever he is are being vented on the wrong person. He should have been grateful for the opportunities he received while working in KEMRI. I respect Dr. Davy Koech because of who he is. He has accomplished more than what he is said to have done. With the respect that some of us have, I think it is unfair for Ombaso to share his views this way. He seems very bitter. We know a parastatal can never be started by one man, but what we know is that someone has to play some role for it to be where it is. Ombaso is bitter, why did the so called 'founders' never appear and claim that they were founders? Prof .Koech has contributed a lot and that is why he was able to survive in teo consecutive regimes as the CEO. Look at where KEMRI is right now and digest it. Dr. Koech fraudulently claimed to have developed a 'cure' for HIV/AIDS. He fooled Moi into supporting it and others. It was later proven to be less effective than a placebo! He should be struck off the medical register. I wish Prof. Davy Koech the best in his endeavors. I can see bitter failures discrediting him but let's give the devil his due.